HUNTERS OFTEN "DISCUSS" using flat-base or boattail bullets, sometimes heatedly — but many don't really understand the advantages or disadvantages of each type. In fact, some supposed attributes aren't always there. Let's start with definitions. It may seem obvious that flat-base bullets have flat bases, but in reality most have a slight rounding or beveling around the edge of the flat base. Boattail bullets have a tapered rear end that still ends in a flat base, like a canoe with a transom for mounting an outboard motor. The entire reason for boattails is to increase ballistic coefficient (BC), a mathematical expression of how well a bullet retains velocity: The higher the BC, the more velocity a bullet retains during its trip through Earth's atmosphere. A boattail reduces atmospheric drag on the rear of the bullet, increasing BC. In theory, flat-base bullets are more fundamentally accurate, because their square base exits a rifle's muzzle more consistently. Boattail bullets (again in theory) have a tendency to tip slightly, because the angled front of the tail doesn't exit the muzzle quite as consistently as a square base. 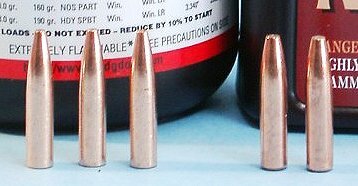 To combat this tendency, some bullet companies make "rebated" boattail bullets, with the front end of the boattail slightly smaller than bullet diameter, leaving a square ledge to exit the muzzle more precisely. But apparently bullet manufacturing has become so precise (like other kinds of manufacturing) that rebated boattails don't provide much accuracy advantage, and the little ledge reduces ballistic coefficient slightly over what might be called a "full" boattail. As a result, very few bullet companies make rebated boattails anymore. Nosler's listed BC's are determined by chronographing the bullets both near the muzzle and 100 yards downrange. Comparing the BC's of Ballistic Tips and Tipped Varmageddons of the same caliber and weight from .204 to .243 resulted in a difference of only 5.2%. But when comparing the Tipped Varmageddons with the hollow-point versions of the same bullets, the BC's of the Tipped bullets averaged 33.4% higher. This means the shape of the tip is far more important than the rear end of the bullet. One interesting aspect of all this is the LEAST difference between the BC's of a Ballistic Tip and the same caliber/weight Tipped Varmageddon is between the 32-grain .204's: The Ballistic Tip's BC is .206 and the Varmageddon's .204. This demonstrates that boattails make less difference in BC in smaller-caliber bullets, because the "drag" on any bullet's base partly correlates to its flat portion's diameter. Also, none of the three major bullet companies making .17 caliber bullets, Berger, Hornady and Nosler, offers a boattail model. This is no doubt partly due to the difficulty of precisely manufacturing tiny boattails, but is mostly due to boattails not making any significant difference in BC on such tiny bullets. Of course, there are also differences in specific boattails. 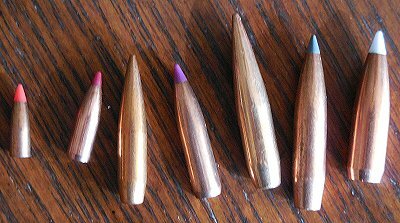 Some are quite short, with a relatively small reduction in the diameter of the flat end of the bullet, while others are very long and much smaller at the rear, typical of the boattails on so-called very low drag (VLD) bullets. As far as flat-base bullets being more accurate, that depends. 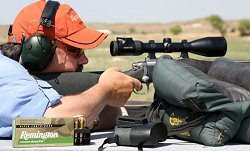 Short-range benchrest shooters, who primarily compete at 100 and 200 yards, mostly shoot flat-based bullets, and the few boattailed bullets have very short "tails." But whether any of this makes much difference to a typical hunter is another question. Differences in BC can definitely be perceived when shooting, and contrary to what some hunters believe, not just at "long" range, but only if we shoot enough in similar conditions with various bullets. A few years ago a magazine editor assigned me to shoot as many varmint bullets as possible over a couple of years, then write up my conclusions. Partly he assigned me the article because I live amid Montana's abundant varmints, so could shoot a LOT in the field. It was quite easy to see the difference in performance between bullets of various BC's on ground squirrels and prairie dogs, even at relatively short ranges, especially when using milder cartridges like the .22 Hornet and .221 Fireball. From about 175-200 yards out, plastic-tipped bullets out-performed hollow-points and softpoints in every way, flattening trajectory, reducing wind-drift, and expanding more violently. However, the difference in BC wasn't due to the short boattails on many lighter .224 caliber bullets, but their plastic tips. Once the caliber and weight of bullets grows larger, however, boattails started making a noticeable difference, especially from 500 yards out, whether shooting targets or animals. On PD shoots I generally take at least one and often two larger-caliber rifles for ranges beyond 500 yards, whether a fast-twist .223 Remington or some big game caliber I want to practice with. For several years I brought a very accurate E.R. Shaw Mk. VII in 6.5-06, which not only did in quite a few prairie dogs out to 800-900 yards, but more significantly, made more first-shot, cold-bore hits at than any smaller-caliber rifle, starting at around 500 yards. But in my 6mm PPC benchrest rifle, built by Arnold Erhardt of Helena, Montana, the most accurate bullet is the 65-grain Berger flat-base target — or was, before they discontinued it, and I've tried several other bullets from smaller makers as well. The Berger averaged around .18 inch for 5-shot groups at 100 yards, while 55-grain Ballistic Tips only do around .30 inch. (However, these Ballistic Tips aren't sorted on a Juenke machine. The Juenke I used for a couple of years belonged to a magazine I worked for, which eventually requested that it be sent to a bullet company.) So is the better accuracy of the Bergers due to their flat bases, or being slightly better-balanced than the Ballistic Tips? I don't know. However, I do know that in practical terms, boattails are more accurate than flat-bases at longer ranges, simply because they drift less, reducing wind-error. For any shooting beyond 300 yards, in any caliber from .224 up, I'll take a boattail that doesn't quite shoot as accurately at 100 yards over any similar flat-base. We often hear how boattail "cup-and-core" big game bullets lose their cores on impact more often than flat-bases. This makes intuitive sense, because we can imagine the square base of the jacket firmly holding onto the base of the core, like holding a freshly-caught trout around its middle rather than by its tapered tail. But some time ago I decided to analyze my hunting notes to see if this claim was true. I've been taking these notes since the early 1970's, and they include information on recovered bullets from both my animals and those taken by hunting companions. My first analysis of the boattail/flat-base question was performed at least 15 years ago, but I just did it again, including a bunch more information from numerous cull hunts taking place from 2000-2010 in North America, Africa, Europe and New Zealand. Some bullets that didn't exit weren't found, for various reasons, so instead of guessing only recovered bullets were included. 1) Just about half the bullets of either type retained their core, so were recovered as intact "mushrooms." The flat-base bullets averaged 60.4% weight retention, and the boattails 61.8%. 2) In other bullets the core and jacket separated, but were found lying close together on the far side of a big game animal. Again, the numbers of flat-base and boattail bullets were very similar. 3) Sometimes either core or jacket wasn't found, or both found widely separated, but the vast majority of the time, one part of the bullet still penetrated enough to kill the animal. Once again, the numbers of both types were very similar. 4) In two instances the jacket was found at the entrance hole, resting against the ribs just inside the hide, but the core kept penetrating, instantly dropping a young buck deer. One bullet was a 130-grain .270 Sierra GameKing boattail, shot into a quartering-away mule deer. The core traversed the chest, ending up in the far shoulder. But the other bullet was a flat-base, a 105-grain 6mm Speer Hot-Cor, and the core broke the whitetail's spine. 5) Only two bullets didn't penetrate sufficiently, requiring another shot to kill the animal. Both were flat-bases, a 150-grain Winchester Silvertip from a .30-06 that failed to penetrate beyond the shoulder joint of a buck mule deer. The empty jacket was found lodged against the ribs, never even entering the chest cavity. The other was an 8mm 220-grain Winchester Power Point from a .325 Winchester, which expanded so widely after hitting a zebra's shoulder it only penetrated one lung — though it did retain its core. Like many hunters, for years I believed boattails lose their cores more frequently because it seemed intuitively "correct," but both times I've looked for statistical evidence it hasn't been there. Consequently, what I'm guessing actually happens is that each time a boattail loses its core, another hunter nods and says to himself, "Yep, another one of those dang boattails came apart!" One indisputable effect of boattailed bullets is an increase in throat erosion, due to hot powder gas slipping by the tapered tail. This has been documented numerous times in military research, but many shooters are willing to pay the price for improved downrange performance. As one gunsmith friend frequently says, "They make new barrels almost every day!" Ask John Barsness Questions About "FLAT-BASE AND BOATTAIL RIFLE BULLETS"
Copyright © 2000-2017 24hourcampfire.com, Inc. All Rights Reserved.